I wasn't sure what to think about this game when I read the reviews, but I am sure glad that I tried this one out. I enjoyed the quirkly humor of the story, the ability to figure out where things go and open up new parts of the mansion. The H0 scenes were not that hard especially when there is a hint button that fills up very quickly (30 seconds, I think). I am not a big fan of lots of H0 scenes, but these were fun to do. I am a big puzzle/mini-game fan and I love the ones I have seen so far. I am looking forward to getting into the second chapter tonight after work. This game is a nice change of pace from the dark, scary ones, although I do love those too, this is a fun game, congrats to the developers! I am looking forward to another game from them! I really really enjoyed this game. Kept my interest right from the start, had a few problems such as the game would lock up but after that no problems. The walk through was excellently done, easy to understand and follow. The graphics were excellent quality and fun to watch. I would very highly recommend this game to every one. Lots of fun to play, this game has become my all time favorite! From a dev that I'm not familiar with comes this peculiar, but challenging game in which you are to locate many antique items that have been carefully hidden throughout the mansion of a now deceased nut case. The long gone owner of the mansion and the antiques apparently had a paranoid need to keep building secret rooms to store the antiques----sort of reminds me of Sarah Winchester's mystery house in San Jose (who was sadly driven by who knows what). Anyway, you'll need your thinking cap for this one to determine the next steps to take after clearing HOS. As I got further into the game, I caught on to the pattern of what they wanted amd found it to be very different and a great deal of fun. Someone put considerable thought into this one, and I appreciate the effort. There are not many bells and whistles, but there is a handy map and a journal replete with its own hints. A few voice-overs, as well, that are decent sounding. The puzzles are different sometimes tossed in with some run-of-the-mill style. But overall, it's different enough to be quite unique, and I liked it very much and will buy it----but I don't know that it's for everyone. 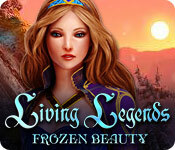 It's such a pleasure to have the free test run on these games----so take advantage of that and give it a try. For those who have been asking for something a little different----here you go!!!! I absolutely adored this game. I put it a cut above the usual run-of-the-mill stuff. I found it intelligent, well thought out, brilliantly put together and thoroughly absorbing. There are wonderful surprises and delightful innovations throughout, not seen before. Same for the mini games, the devs included new puzzles of their own, instead of just using the same old ones everybody uses. Lovely graphics, with beautifully designed locations I think these devs are highly creative and very talented and will definitely make their mark on this industry. I am very much looking forward to their next offering. I would love to see a CE by these guys. I think it would be awesome. Cool - game! It's got an auction, hos, puzzles galore, AND a neat little gnome who gives you clues about the demise of the owner of the mansion and all the antiques! Some pretty cool puzzles, this game has kept my interest peaked since beginning it - each level brings a new surprise! You get to ferret out hidden rooms, tunnels, etc., to find antiques that have been hidden. I usually only play games like Gardenscapes, Chronicles of Albian, etc, when I am bored and don't have any other games to play - but this one, well, let's just say it beats them all hands down! It's got a little of everything, Match 3, the auction as mentioned above - where, btw, YOU control how much you get for items, hos - which for the most part are pretty easy. Have loved playing this game - can't remember when I was so excited to get to the end of a game! Must get back to it! My first impression was of a faintly pointless loosely joined story with quite illogical goals but played for awhile and discovered a gem of a game! There's mystery behind the seeming madness and the odd HO scenes are wonderfuly quirky. The hints in your journal and the hint button make for very low frustration levels and the voiceover is very appropriate. My only downer is the "auction" but that's mainly due to my visual problem #symbols move too quickly# and since it's not required to finish the gameyou can skip the higher levels.. 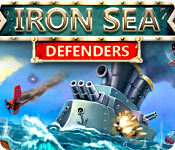 Still it adds yet another layer to a creative and entertaining game. Worth trying and buying! After playing more than half of the demo, I stopped playing so I could buy "Antiques Mysteries: Secrets of Howard's Mansion." The mini games are unique and thought provoking. So far I have loved each of them, although I am stuck on one of them, but I will keep at it until I get it. I am enjoying this game tremendously! I wish there were more like it. Developers -- keep up the good work. Refreshing! Developer has listened to us fishies!! A great game. Bright and cheerful, no wearing your shoes out either. Music was pleasantly "background", light and unobtrusive. Graphics were clear, no dark corners. Voice acting was spot on. No difficulty levels, tho you could turn off hints in the options tab. Hint button filled in 30 seconds, and could be used to indicate where to go next. Map provided though I didn't need it, no lengthly backtracking to do, but it was nice to have to keep me oriented. Loads of puzzles which were sometimes simple (slider, pipes,rotate blocks) and some were REAL puzzlers.!! 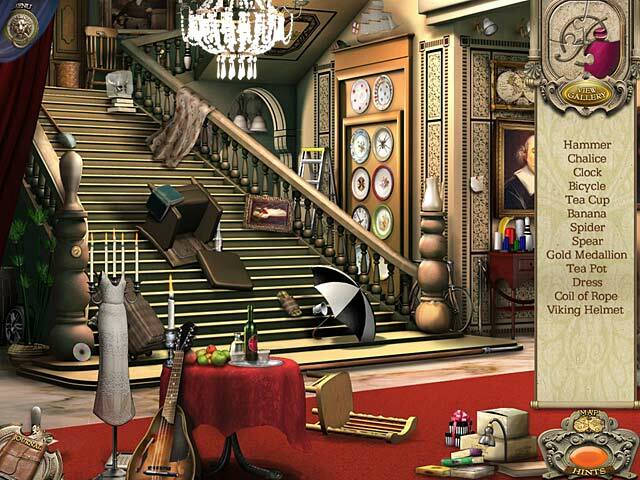 Hidden objects were not the total junkpile, more of a "scattered round the room" type. Though some items were small, I still managed to find nearly all of them, though my eyesight is less than perfect. The story line was good too, and at last we have a game that gives a completed ending and doesn't leave you wondering. Well done developers, this game was well worth the money. I absolutely loved this game! It was very imaginative, and clearly lots of thought went into creating it. 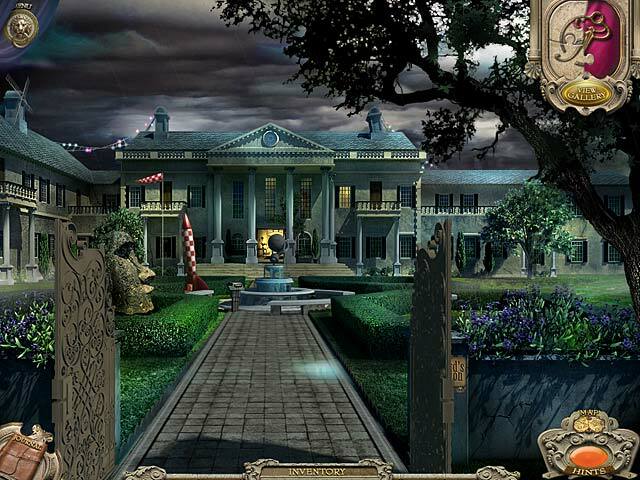 It kept me entertained and built a lot of suspense as to why the mansion owner built all those secret rooms. The minigames felt very fresh and fun, and the challenge level felt just right to me. The HO's were proportional to the scenes and I didn't need to use the Hints much. Great that the hints also work outside the HOS mode to help throughout the game if you need it. 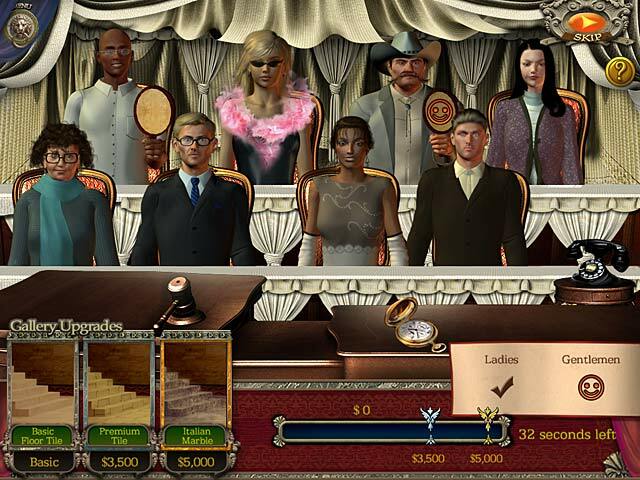 Was very pleasantly surprised to discover a whole auction game inside the antique gallery with characters who bid with paddles! Don't miss that, it's up the staircase inside there. That was lots of fun for decorating your gallery. The secret rooms were very cool, and there's an intriguing little character that appears later on, won't give it away, but very funny and fills out the storyline just great. Enjoy, highly recommend it! I have just finished the demo and only achieved Chapter 2 (the salon) of 7 which is a good sign of a game for me. The graphics, although a little old-fashioned, are very bright and clear and the objects are well disguised and gave me that 'Doh!!' feeling when I have used a hint to find one. The story is intriguing and I feel sure there is a twist in this apparently 'normal' tale of an eccentric milionaire. The sound effects are cool to the point of the coughing sound after the wall is blown up.and the voice of the groundsman is appropriately English and very smooth. I found the puzzles challenging and once started there is no way out other than a skip button so I had to stick with it. I only skipped one but that was only because I was stuck and wanted to get further in the hour. Next time round I shall keep battling. The hints are in the objectives tab of the journal and give an excellent guide to what is expected next.... and another 'doh' moment. This is a buy for me as it is all round good, cheerful fun but the shadowy figure lurking about the place makes me feel a more sinister ending is due. Nice one Felix.